If you hunger for a free account in Demonoid.com (now hosted on Demonoid.pw domain), a massively popular semi-private BitTorrent tracker and torrents site which on par with ThePirateBay, and also indexes external torrents, head to Demonoid website now, as the public registration is now opens. With a registerd account, users have access to tons of torrents and contents in categorizes such as Anime, Applications, Audio Books, Books, Comics, Games, Miscellaneous, Movies, Music, Music Videos, Pictures, or TV. Currently free registration on Demonoid only opens once a month, although in May, registration was open twice for 2 days, on May 2nd and 8th respectively. Everyday else in the month registration will be closed, and interested users will have to find invites or invite codes which cannot be sell or trade from existing Demonoid users who are in good standing during these closed registration period. Register for your free Demonoid account http://www.demonoid.com/register.php (now demonoid.pw). Missing out on the open registration period of Demonoid? Download Tracker Checker that monitor Demonoid and notify you when registration is opened. 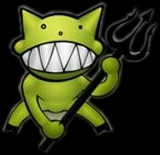 Update: Demonoid public registration opens again on mid June 2007.